This week I was staying with my godmother in Norwich for a few days, and so on Wednesday ended up spending the day with her at the church she attends, St. Andrew’s in Trowse, as part of the Open Church Week in the deanery. The idea is very simple, that churches in the area were open during the week, so people could drop in, look around and chat to someone from the church if they wanted to. Since a lot of parish churches are locked during the week this is a wonderful opportunity for anyone who is interested to have a look round, but it also means quite a lot of work for parishioners willing to spend time at the church, making tea and coffee, welcoming visitors and chatting to them. I had already arranged to visit my godmother and booked my train ticket, when she re-checked her schedule and realised that she was busy after all. Since I have been thinking (and blogging) a lot about the welcome visitors receive at church I thought it would be a good opportunity for me to be on the other side of things, and anyway, I find people endlessly fascinating and can usually find something to talk about with anyone I meet. We arrived at 10am and left at 4pm. I discovered that my capacity to chat to anyone I meet is not, in fact, endless, but rather I hit a kind of wall at 3pm and felt quite drained. Before I felt completely talked-out, however, I had some lovely conversations with people who visited the church. For most of the day there were just three of us there; my godmother, the assistant priest and me. The visitors seemed to fall into three categories; people who knew it was Open Church Week and had come from outside the parish; people who lived nearby and didn’t attend the church but were curious to come and see it, and finally other members of the congregation who popped in to say hello and have a chat. The first visitors of the day were a couple who had driven from another county to visit several local churches in the hope of finding the graves of two great uncles who had fought in the First World War. Not only did they manage to find the graves in the graveyard at St. Andrew’s, but they also found photographs and other information about their ancestors in the small exhibition commemorating the start of the war inside the church. They stayed for a while and before they left took photos of the graves as a reminder of the connection they had made. The next visitors were a retired couple with their daughter, accompanied by a friend who was a member of the church. While the wife, daughter and friend looked around the church I made the husband a cup of coffee, plied him with chocolate biscuits and chatted to him about a lot of things; his experiences working in Kenya, Julian of Norwich, prayer . . .
We had a couple of visitors who were already members of the church but who wanted to pop in to say hello, and then we decided it was time for lunch. Just as we were finishing a woman walked in and since my godmother and the assistant priest were in the middle of a conversation I got up to welcome her. She lived very near St. Andrew’s, but had attended only once, just before Christmas last year. She had so many questions about the church, about faith, about issues of gender and sexual orientation. We talked about the early church, I mentioned Julian of Norwich again, and then felt that as a lay person and not even a member of St. Andrew’s it would be wise to ask the assistant priest to join the conversation. I felt so impressed that this visitor had thought about so many issues, and so glad that Open Church Week had given her an opportunity to come in to church and discuss those questions. Later, a young father with two young children came in. They were on their way to the park but had seen that the church was open and decided to come in and take a look. They spent some time exploring the church, looking at statues, carvings and different parts of the church. While I was happy to see the visitors from further afield, I really felt that this woman, and this father with his children, were the ones to really benefit from the church being open and may feel more inclined to attend a service now that they have had the time to express their concerns, speak to one of the priests and have a look round. Maybe it demystifies it a little, maybe they feel they know a bit more about the church before they try it on a Sunday morning. Towards the end of the afternoon more parishioners dropped in. I had a conversation with an elderly gentleman, but by then was really feeling quite talked out. After he left I sat quietly on the other side of the church to the small group sitting and chatting, and then went outside for some sunshine and fresh air. It was lovely to be part of Open Church Week, and to try to be the welcome I would like to receive myself. I feel very strongly that the welcome a church extends to visitors, and the support that is given to anyone not accustomed to the service is so important. Spending the day welcoming and talking has given me a lot to think about. 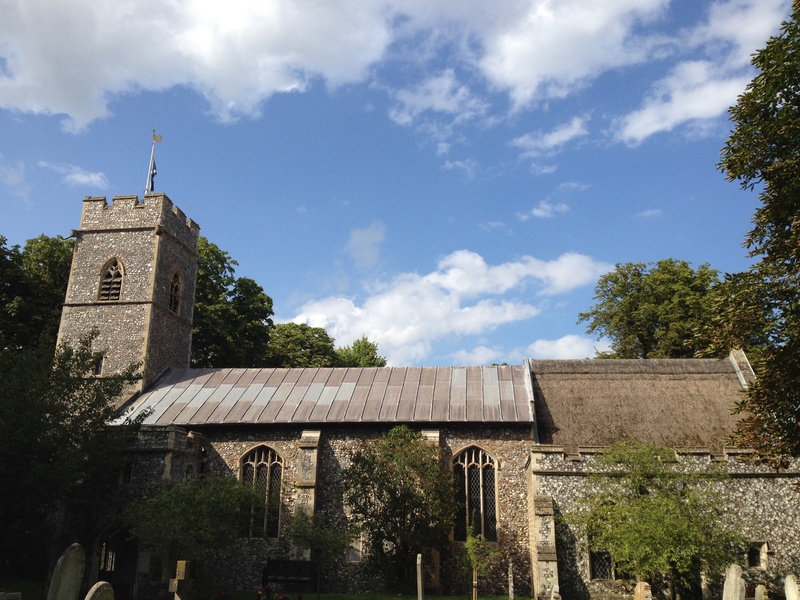 This entry was posted in Travel and tagged Julian of Norwich, Norwich, Open Church Week, St. Andrew's Trowse by tokyopurplegirl. Bookmark the permalink.